, a learned member of the French Institute, whose Christian name we have not been able to discover, was born at Paris in 1735. In his youth he applied sedulously to study, but we have no account of his progress until he became acquainted with the celebrated | geometrician Fontaine, who foresaw the progress which Vandermonde would one day make in the mathematics; and under his patronage, Vandermonde determined to devote himself to geometry. In 1771 he presented himself to the Academy of Sciences, into which he was admitted; and justified the suffrages of his associates, by a paper relative to the resolution of equations. From the sixteenth century, the method of resolving equations of the four first degrees has been known, and since that time the general theory of equations has received great improvements. In spite, however, of the recent labours of many great geometricians, the solutions of equations of the fifth degree had in vain been attempted. 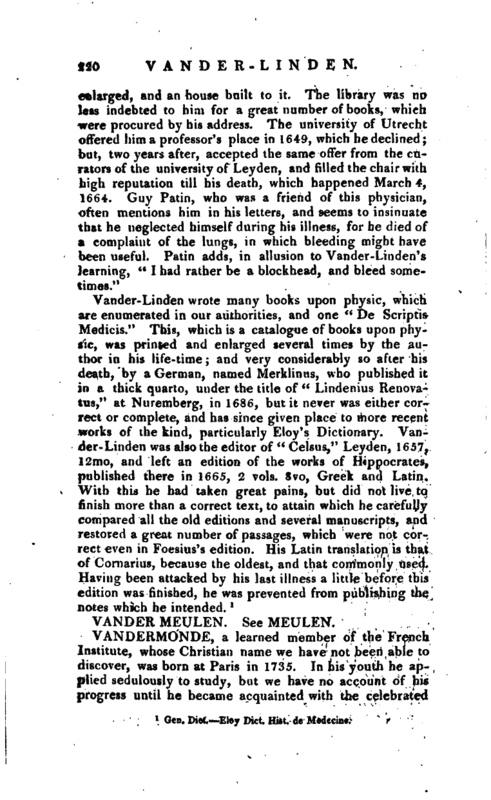 Vandermonde wished to consolidate his labours with those of other illustrious analysts; and he proposed a new theory of equations, in which he seems to have made it particularly his business to simplify the methods of calculation, and to contract the length of theformufac, which he considered as one of the greatest difficulties of the subject. 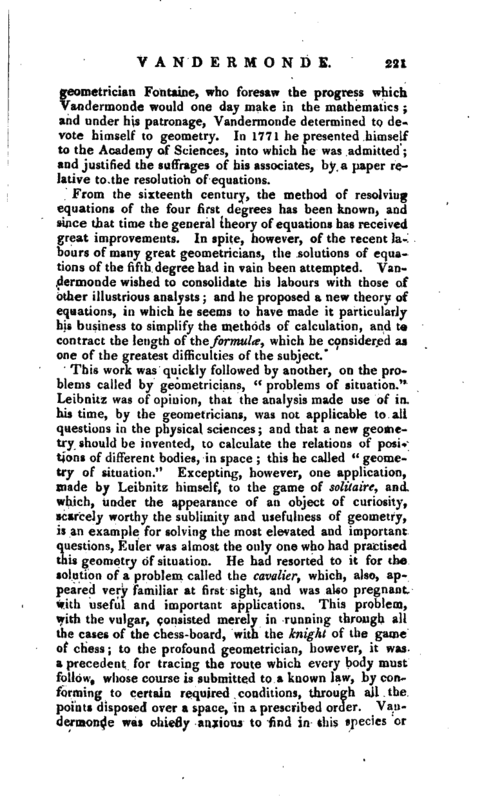 This work was quickly followed by another, on the problems called by geometricians, '“problems of situation.” Leibnitz was of opinion, that the analysis made use of in his time, by the geometricians, was not applicable to all questions in the physical sciences; and that a new geometry should be invented, to calculate the relations of positions of different bodies, in space; this he called “geometry of situation.” Excepting, however, one application, made by Leibnitz himself, to the i game of solitaire, and which, under the appearance of an object of curiosity, scarcely worthy the sublimity and usefulness of geometry, is an example for solving the most elevated and important questions, Euler was almost the only one who had practised this geometry of situation. He had resorted to it for the solution of a problem called the cavalier, which, also, appeared very familiar at first sight, and was also pregnant with useful and important applications. This problem, with the vulgar, consisted merely in running through all the cases of the chess-board, with the knight of the game of chess; to the profound geometrician, however, it was a precedent for tracing the route which every body must follow, whose course is submitted to a known law, by conforming to certain required conditions, through all the points disposed over a space, in a prescribed order. Vandermonde was chiefly anxious to find in this species or | analysis, a simple notation, likely to facilitate the making of calculations; and he gave an example of this, in a short and easy solution "of the same problem of the cavalier, which Euler had rendered famous. His taste for the high conceptions of the speculative sciences, as blended with thrat which the “arnor patrias” naturally inspires for objects immediately useful to society, had led him to turn his thoughts towards perfecting the arts conversant in weaving, by indicating a manner of noting the points through which are to pass the threads intended to form the lines which terminate the surface of different regular bodies: accordingly, a great part of the above memoir is taken up with this subject. In the year following (1772) he printed a third memoir; in which he traced out a new path for geometers, discover* ing by learned analytical researches, irrational quantities of a new species, shewing the sequels of which these irrationals are the terms or the sum, and pointing out a,direct and general method of making in them all the possible reductions. In the same year appeared his work on the “Elimination of unknown quantities in Algebra,” or the art of bringing back those equations which include many unknown quantities, to equations which contain only one. In 1778 he presented, in one of the public sittings of the academy, a new system of harmony, which he detailed more fully in another public sitting of 1780. This system obtained the approbation of the three great musicians of his time, Gluck, Philidor, and Piccini. Dr. Gleig’s Suppl. to the Encyol. Britanuica, from La Cepede’s Eloge.